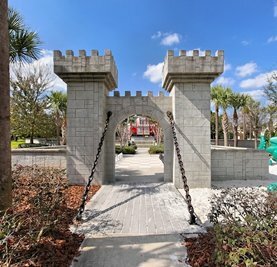 With all the Orlando vacation rental homes available nothing is closer to Disney than making your vacation headquarters Mickey�s Movie Manor and you�ll not only be close to Disney World, but you�ll also have endless entertainment options even closer at hand within the exclusive Windsor Hills resort community. Mickey�s Movie Manor is a four-bedroom / four-bathroom, air-conditioned vacation villa that sleeps up to 8. Pull into your private driveway and walk through the front door into a spacious, open-concept living area with contemporary d�cor. The living room space is outfitted with comfortable furniture that�s perfectly positioned to watch the HDTV. There�s also free Internet throughout Mickey�s Movie Manor so you can keep in touch with friends back home. Beyond the sliding glass doors is the huge screened lanai with large swimming pool and spa. 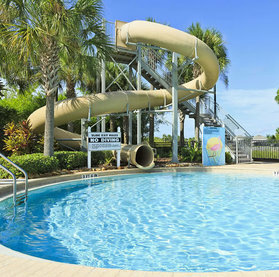 Imagine the fun you and your family will have playing in the water. There are also patio chairs and a dining area outdoors so you can enjoy a meal outdoors whenever you want. Near the living room space is the formal dining room area with a table that seats eight. It is an elegant space where you�ll enjoy serving guests your most succulent culinary creations. The Mickey�s Movie Manor kitchen is open to the main living area and is fully equipped with everything you need to prepare snacks or full course meals for your family. You�ll love the expansive counter tops and handy breakfast bar where guests can sit and share a cup of coffee. There�s also a breakfast nook in the kitchen where you can easily serve four. It�s also a great place to gather guests for a card game after dinner. The master bedroom includes a comfortable king-sized bed, large dresser and TV that�s perfectly positioned for late night viewing. 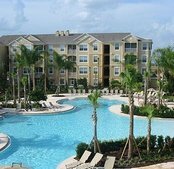 There�s also a sliding glass door that leads out to the lanai so you can enjoy the balmy Florida nights under the stars. All four bathrooms in Mickey�s Movie Manor include shower/tub combinations and vanities with plenty of room to spread out toiletries and get ready for the day. The second bedroom offers another king-sized bed and large dresser with a flat-screen TV mounted above it. The third bedroom is one the kids will love with its twin beds and minion theme. There�s a TV in this room so kids can watch their favorite shows. The fourth bedroom also includes two twin beds, a TV and dresser. All rooms are large with plenty of space to spread out and get comfortable. There�s also a washer and dryer to help you keep your family in clean clothes. The real treat at Mickey�s Movie Manor is the theater room with plush chairs where you and your group can enjoy your DVD movie favorites or cable television in complete comfort. There�s also an air hockey table nearby in case the kids want to get in a quick game. 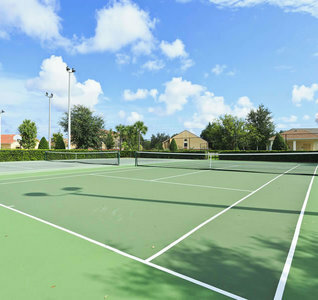 In addition to all the pleasures of Mickey�s Movie Manor, the Windsor Hills community offers a wealth of entertainment possibilities including a huge pool with water slide, game room, tennis courts, basketball courts, fitness center, playgrounds and much more. There�s so much to do, you may have trouble finding time to visit Disney World! Book your stay at Mickey�s Movie Manor today! Cancellation: 75% refund if canceled within 60 nights of arrival - 50% within 30 nights of arrival. Really nice home in a great community. Pool is really nice. House and resort were great. Very comfortable and spacious. Very impressed with resort. Would stay again in future. Loved our trip. Our family had a super fantastic time staying at this house in Windsor Hills. The owner, Robert, was a great host and made us feel comfortable with our choice of home and our overall stay. So close to all the action and parks but also in a quite secure environment. The community is gated with a 24/7 staffed gatehouse. Felt very at home here. Can�t wait to return. Don�t hesitate on this house. Thanks Robert for making our Disney trip so memorable. We absolutely loved this home, 4 bedrooms all had TV�s plus the media room. Kids loved to sleep in the mickey room or minions room. The pool at the house plus the pool with the slide, the kids wanted to stay at the house opposed to Disney. It was such an amazing home and we look forward to future stays. This property is perfect for large families. We had 4 adults and 4 kids and there was plenty of room for everyone not to be on top of each other. The beds were very comfortable and the pool & theater room kept our kids very entertained. Shipt delivers groceries to the house, which was extremely convenient. 5 stars! We'll definitely be back. Thank you for remarking on our service. We want to always make sure our guests know they can count on us as owners who take pride in being there in the event they need us, for anything. We were sorry one of the stove top elements did not work and were glad to have replaced it the next day. Thank you for bringing it to our attention. Hope to see you soon on another Disney getaway. Owner Response Thank you for remarking on our service. We want to always make sure our guests know they can count on us as owners who take pride in being there in the event they need us, for anything. We were sorry one of the stove top elements did not work and were glad to have replaced it the next day. Thank you for bringing it to our attention. Hope to see you soon on another Disney getaway. We had a great time at Mickey�s Movie Manor! We had 4 adults, and 4 children and had plenty of room. The kids loved the pool and the theater room (especially the air hockey table) the most. The neighborhood is quiet and feels very safe. Robert was very quick to answer any questions we had and was a pleasure to work with. We would definitely come back to this same home in the future. Thanks again for everything! Nice place plenty of room and close to all of the attractions. Great house! We loved the private pool and kids loved the theater room. Everything you need is there and when it's time to leave you want to stay. 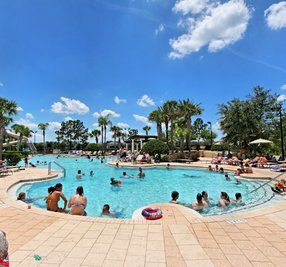 The location is only a few minutes from Disney. 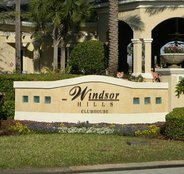 Windsor Hills is a secured resort with security at the entrance. Shopping is a short distance away so the convenience for groceries or a forgotten item is there. There are a variety of restaurants for eating out or if you cook at your town home you have everything you need to make your own meals. It's a great place and the owner and his staff are exceptional in every way. First let me say that the owner's communication is SUPERB. The house itself was immaculate and had all of the comforts of my own home. Each bedroom has its own bathroom which was super awesome and made getting ready stress free. The theater room was awesome! The proximity to the parks was great too. VERY CLOSE. The house itself is located in a guard gated community which I really liked too. Will for sure stay again!! Owner Response Thank you, Concetta Isn't nice to have all those bathrooms? :) Thank you so much for your kind comments about our Windsor Hills home. The location is key for sure. Many of our guests don't even realize how close they are to the "MAGIC" until they take their first trip over to Disney from the house. Can't wait to have you all again. And when you return, you'll find some nice community pool upgrades (Easter 2018). The house is very close to the parks, but quiet enough to relax after a day at them. This was ideal for us because our trip included some very early mornings for some run Disney events. Our group included two families and the seven of us had plenty of space to spread out. We never made it to the community pool, but the kids were in the house pool as much as possible. Robert (owner) was very quick to answer questions before and during our stay. We had an issue with the AC on the Sunday we were there and the property manager had the issue evaluated and the repair schedule and completed while we were at the parks. That's great service! Owner Response Thank you for your comments on our Windsor Hills vacation home. We were glad to have had you and your family stay with us. We're also glad to hear that you found our service level to be up to par. We have always built our reputation from not just our house, but our level of customer service. We want our guest to know that if they need anything whatsoever, we and our local management team are there to take care of any issues that may arise, and do so as quickly as possible. The trouble you had with the AC was a small capacitor that failed and was easily corrected within 10 minutes of our technician arriving on property. We recently installed a brand new system, but the technician stated that although rare, this can happen at any time. Nonetheless, we're pleased that that matter was handled quickly and to your liking. Hope to accommodate you all again on a future trip to the Disney area. My parents decided to take the family to Disney so I looked into the area and planned the trip. There are only 6 of us (Grandparents, my wife and I and 2 boys: 4 and 6). I decided to stay off resort to give us some privacy and a space to decompress and relax. This house was perfect for us. We spent most of our time at the house in and around the pool or in the theater/game room. Access in and out of the community is great and it is close to both Disney and shopping/restaurants. We didn't use the 4th bedroom at all, there is easily enough room for 8. It was a great trip and the house worked great. Owner Response Thanks Nick! My family and I are happy you found the house, community of Windsor Hills, and the surrounding area perfect for your Disney vacation. Thank you additionally for your time in reviewing our Windsor Hills vacation home so that others can read about what a wonderful place it is. 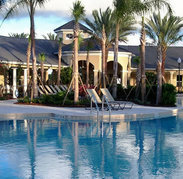 We are truly blessed to have found such a nice home near Disney to offer our guests. Hope to have you stay again if a Disney trip finds you in the future. The house was great. 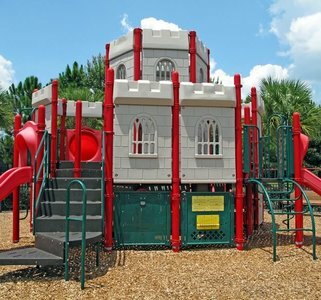 Plenty of space and the property has a very large playground and pool that the kids loved. The private pool at the house was nice too. Awesome trip! The property's description was very accurate. The stay was very comfortable (we were a party of 7), the pool adequately heated, and Robert was very responsive to our needs. The movie room was a highlight, super cool, for the kids as well as the adults. The condo is also great, very easy access, located close to major attractions. Highly reccommended! Could do a little better with house cleaning equipment, not enough to maintain the house for longer stays.Recommended for: People with Disabilities, Families with Young Children, Pet-friendly, Sightseeing, Age 55+, Families with Teenagers. Owner Response Thank you for sharing with others your experience with our Windsor Hills home. We appreciate your feedback and are happy you enjoyed yourselves while visiting the Disney area. Like most vacation rentals, our home is self-catered and professional cleaned prior to and after your stay. We will meet with our staff to access the cleaning supply products offered to guests. Hope to see you in the near future. The property was everything as described. Interior was clean and well kept. The location was as close as described in the listing. 5 minute drive and you were on World Drive which leads to MK, Hollywood Studios, etc. Location was close to shops, dining, entertainment. Very easy access to other interstate and toll roads to Sea World or Cocoa Beach/Cape Canaveral. If driving remember to bring enough money for tolls, as toll roads are almost necessary for some trips. (Ex: cost of round trip to Cocoa Beach was approximately $8.00 U.S.). Our kids loved the pool, and the south west exposure helped heat up the pool during the day. We stayed late October and pool heat was not necessary. Owner was very responsive to any inquiries and replied in a timely and detailed manner. Will definitely recommend this listing to other friends and relatives looking to book an off-site property. Our only issue was the master bed box spring/frame was broken, which created a bit of a slump on one side of the bed, but the mattress itself was very comfortable. Everyone in our party enjoyed their personal room/space. You will have to purchase extra supplies at the local store (ex. paper towels, TP, dish, laundry, and hand soap) as the provided supplies will only last maybe a day, but that was expected as it is detailed in the listing. Overall wonderful property, secure location, (gated access) well maintained and very close to Disney. Owner Response We are very pleased you enjoyed your visit and appreciate your thorough review of our home. We will immediately address the matter with the bed frame and have that sorted out quickly. Thank you once again from my family to yours and we look forward to accommodating you on a future visit to the Disney area.